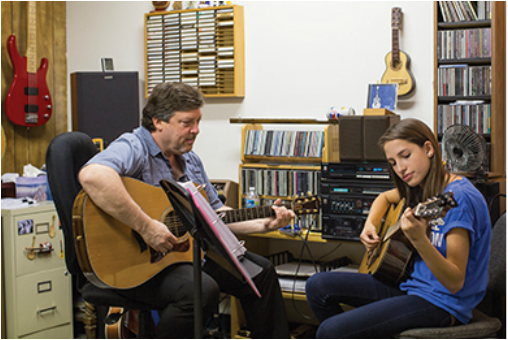 ​With over 40 years of experience teaching music to students of all ages, John is skilled at targeting lessons for each student according to their ability and interest. He teaches electric, acoustic, lead and rhythm guitar, bass, mandolin and ukulele. John's teaching approach weaves instruction and play in a way that keeps students excited about their learning. He encourages his students to “play” their instruments more than “practice” them. He sings and strums along with them, reasoning that it’s more fun to play with someone than to play alone. For rates and other scheduling details, see Rates & Policies. John with student, Maren Valenti, who has been playing for 9 years. ​Tosco Music Studio has independent instructors who currently teach piano, voice and drums. ​​Contact an instructor directly for their rates and scheduling information.